Description and results of tests. Tables and photos. Object of tests to check the functioning of the mechanism and to check the ballistic characteristics of this weapon. Tables and drawings. Development of weapons by Rheinmetall-Borsig. 31 May 1945. Contains: Organization; ballistics and ammunition for automatic weapons; 5.5 cm AA weapon 58; 15 mm aircraft gun HF 15; weapons SG-117—SG-119; armament of high speed fighter planes ; 37 mm gun 341; 3 cm SG-116; 5.5 cm aircraft guns MK-l 12 and 114; 5 cm SG-500; 35 cm recoillcss aircraft gun 104; misc. weapons; development of light AA carriages; aircraft armament installation; 5.5 cm automatic recoil less aircraft gun MK-l 15; development of light alloy steels for automatic weapons. Drawings, diagrams, graphs. Target was examined, samples of weapons collected and staff members interrogated. Covers: Automatic weapon design and development; bombs and rockets; fuzes; controlled missiles; ballistic and other apparatus; organization of firm. Illustrations of MK 112, bombs and fuzes. 2 cm flak 30-waffe; beschreibung, wirkungsweise, aun behandeln. Berlin, 1937. The MG 131. (In Flight, Mar 18, 1943, p. 285) Describes German 13-mm aircraft defensive weapon. Illustrated. Description, operation, nomenclature and figures. Descripcion e indicaciones de servicio para la ametralla-dora dc avion modelo ST 61. Berlin, 1036. (In Spanish) See ONI Translation 610 for English. Illustrated. Description and action of the 2 cm automatic gun, Mark ST 5. Berlin, n. d.
Gives description, action and nomenclature of parts for A/A and A./T 20 mm gun. Drawings included. Description of gun cal. 20 mm ST 8, mounted on car, mode of acting and short prescription of service. Berlin, 1936. Description of automatic firearm specially designed for mounting in cars. Photos. Description of ST 61 aircraft machine gun and directions for operation. 1936. (ONI Translation 610) Translated from Spanish by ONI. Einbaumappc MK 108. Apr 1944. (In German) Contains data and installation diagrams for MK 108 cannon. Data, description, drawings and photos. Also included arc descriptions and photos of gun ring mounting Mark T 13-111 and twin drum magazine Mark DT 20—T 12-201. Rheinmetall gun based on Ehrhardt design. 2 cm aircraft automatic gun MK ST 11. 1938. Contains description, action, ballistic data, ammunition, drawings. Also a description of aircraft gun ring MK ST 14 for swivelling installation. 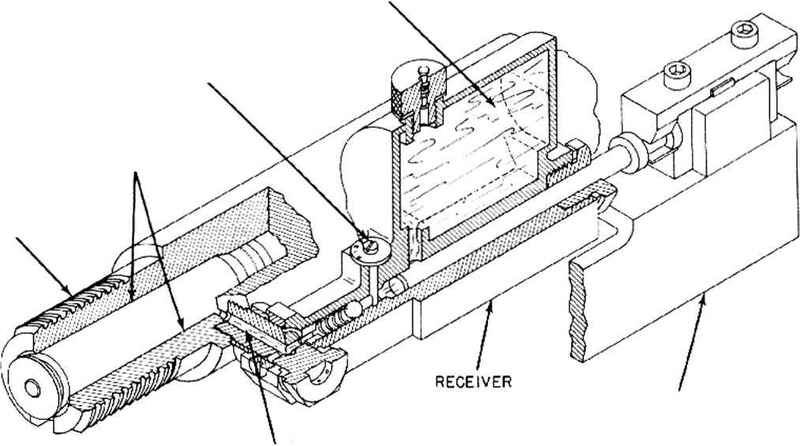 Describes aircraft gun, type 15, using 7.9 mm cartridge. Also flexihle gun mount. Photos. The machine rifle S.2 200 made bv the Solothurn A. G. II Sep 1930. (Report no. D 11,040) Description and illustrations. Unterluss is proving ground of Rheinmetall-Borsig Co. Describes: 37 mm a/a gun: 20 mm machine gun S 5-100: 2 cm anti-tank gun (Tank Buchsc), Mark S ¡8-100; 2 cm aircraft gun (revolving ring mount); MG 15 (aircraft), 7.9 mm. Description, operation, diagrams of MG 15 arc included. Describes organization of new Swiss firm under controlling interest of Rheinmetall. Key personnel are listed. Description of Solothurn Swiss weapon, offered to U. S. for testing. Gun, machine, aircraft, 30 mm MK 108A3—German. 7 Nov 1945. Preliminary report with brief description, specifications and photo. Waffenfabrik Solothurn A. G. The machine rifle Rh. 29. 1929. Description and illustration of light mg with 8.5 kg weight and 7.9 caliber. The 20 mm machine gun S5 100. Solothurn, Switzerland, n. d.
Fired against ground and aerial targets. Weapon is described and illustrated.